Kim and Kanye for Harpers Bazaar and a strange interview. Kim & Kanye do a joint interview. Everyone scratches their head. Kanye West and Kim Kardashian West just did sit-down Q and A for the September issue of Harper’s Bazaar. Between the selfie-styled fashion shoot and the quotes that are either Yoda-like or completely nuts (possibly both), it’s like Christmas has come early—especially if your idea of Christmas is laughing a lot while you look at your phone on the train. Food for thought, before we jump into the best bits. Is Bazaar messing with us? Are Kim and Kanye? Are we all being trolled at some mass pop cultural level? Honestly, at this point, who cares. We’re all marinating in the Kardashian phenomenon whether we wish to be or not, and one of the most compelling parts about it is the very unusual marriage of KW and KKW. Valiantly, they have taken it on themselves not to disappoint us by being in any way normal. This interview is as gloriously odd as we could have hoped. The interview is ‘by’ Bazaar Global Fashion Director (and former Paris Vogue editor Carine Roitfeld). She didn’t write it though (Australian journalist Laura Brown asked the questions), or take the photos (that was Karl Lagerfeld). So what she did is a bit of a mystery. But if you don’t know her, just imagine a skinnier, scarier, French-er Anna Wintour with more eye-liner. The same description applies to Lagerfeld, actually. And it’s all. Just. Gold. The interview begins in the West-Kardashian West house in Los Angeles’ Bel Air, which is apparently “majestically minimal”. Then we get to the important topic of what Kanye’s favorite body part of Kim is. Lol. Also, in the words of a colleague, “I now want to punch something.” Mainly lol, though. Look at this photo. Look at it. 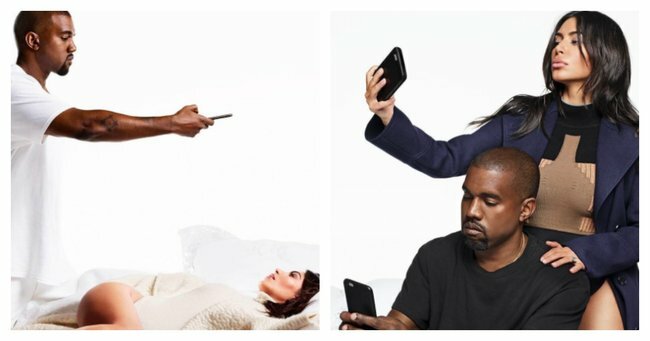 Kim and Kanye are trolling us. They must be. Back to the interview. Kim also says heart, because now otherwise she’d look mean. “And I’ve always loved his legs,” she adds thoughtfully. Taylor Swift gets brought up, inevitably when the interviewer-who-is-not-Carine-Roitfeld cheekily asks them to name their favorite Swift song. “I was such a fan of hers,” says Kim. Even in print, the past tense kind of looks like it’s surrounded by little knives. Then the pair are asked which historical figure they identify with. “Us?” Kanye asks. It’s unclear whether he’s clarifying if she is directing the question at them, or if he and his wife are actually the historical figures he most identifies with. I’m going with option two. The interviewer asks about special talents. Watch: Kanye responds to his feud with Taylor Swift in typical Kanye-style. Post continues after video. Thank you. Thank you, God of weird celebrity interviews. Please say Kim at this point leaned in to smell the interviewer’s teeth. To try and tie in the photoshoot, somehow (which inexplicably includes shots of supermodels Natasha Poly, Lara Stone, and Lindsey Wixson posed in luxuriously heavy coats on white beds), they talk about selfies. Yes! He finally came out and said what we’ve all been thinking. Kim not being able to be naked is exactly like someone stopping Adele from singing. It has to be said though, they are such a rock-solid team. On the subject of privacy, and the stuff they wish people didn’t know, Kim brings up her pregnancy, and insecurities about her body. Kanye jumps in, to…I’m not even sure how you’d describe it. To reassure her. You could not write this stuff. You can barely even understand it. These two are a gift.